Set in the late 1800s in rural England, Gone to Earth focuses on the life of Hazel (Jennifer Jones), a poor country girl who is sensitive and caring, but also independent, wilful and reluctant to get married. However, two men appear on the scene who change her life dramatically; Jack Reddin (David Farrar), a dashing and dangerous squire who can offer her a carefree life of passion, and Edward Marston (Cyril Cusack), a straight-laced and dependable parson, who represents a safe and secure future. Being superstitious, Hazel lets fate decide whom she should marry, decreeing that she accept a proposal of marriage from the first man who asks her. Although Hazel is attracted to Reddin when she first meets him on a country road and stays at his estate, she is also wary of him and goes to great lengths to avoid meeting him again. Instead, she accepts a proposal of marriage from Marston and moves in with the parson and his mother (Sybil Thorndike). But Reddin will not be easily swayed from pursuing Hazel, and it’s not long before they end up together, jeopardising Hazel’s marriage to the parson. The premise of Gone to Earth is deceptively straightforward and makes the film sound like any number of cliche-ridden, conventional, over-the-top romantic melodramas, but Powell and Pressburger avoid making a predictable, straightforward love story. Passionate without being overwrought, romantic but not overtly melodramatic, the romantic drama that is played out is entirely convincing, but at the same time it is not stifled by a strict adherence to realism, thanks to the combination of fantasy and reality that Powell and Pressburger bring to the material. They filmed in real locations and transformed the countryside into an imaginative backdrop to tell a darkly magical fairytale. With numerous breathtaking shots of the vast English countryside, the film’s location work is simply gorgeous to behold, with the luminescent Technicolor giving the realistic settings an otherworldly quality. The opening shots of the fox-hunt (with Hazel rescuing a fox cub from the hunters) act as a visually arresting but unsettling prologue to the main love story, foreshadowing events to come later in the film. In this sequence there are cutaway shots to images of nature (rabbits, mice, trees, mountains) suggesting a link between Hazel, the natural environment and the animals (who she regards as God’s creatures, unlike some of the god-fearing people in her community). The location shot opening sequence is brought to an abrupt halt when Hazel rushes into her home and is framed in the outline of a coffin lid being made by her father (Esmond Knight), which acts as another ominous portent of things to come. Hazel can be seen as a Snow White/Red Riding Hood figure, an innocent young woman in beautiful surroundings, unaware of the potential dangers around her. She is portrayed as being more in tune with nature than people, and she puts a lot of her faith in magic, frequently reading from her mother’s book of “Spells and Chants”. Hazel is treated as a virtual witch towards the end of the film due to her inappropriate behaviour with Reddin, and she is shunned by most of the representatives of her community, with the exception of the parson, who is the only one who sees that she is essentially a good-natured person (and who feels that it was his fault that Hazel fled his home and ran straight into the arms of Reddin). Jennifer Jones plays Hazel as a feisty, headstrong heroine, but also as someone with a sensitive soul. She is like a more down-to-earth Scarlett O’Hara (Vivien Leigh) from Gone with the Wind (Victor Fleming, 1939); a strong independent woman who is buffeted by the world around her; romantically involved with two men, but nevertheless surviving on her cunning and almost animal instincts. Interestingly, Jones was also cast in Duel in the Sun (King Vidor, 1946), a David O. Selznick production that was designed to repeat the success that Selznick achieved with Gone with the Wind. But whereas Scarlett is tough to the core, and a thick-skinned survivor who can overcome whatever obstacles are put in her path, Hazel is more sensitive and not as confident or stubborn, and ends up being more adversely affected by the events surrounding her. David Farrar and Cyril Cusack may play opposites in the film, but there’s something about Hazel that captivates them, and which sets into motion a series of impassioned encounters and fateful occurrences. Although all the performances are excellent, Hugh Griffith – who plays Andrew Vessons, the servant to the squire – almost steals the film, with his amusing, but never stupid antics. Griffith turns a familiar character who could have been a buffoon into a witty and rather touching man, who is loyal to the squire, despite his frequent disdain regarding his master’s behaviour. Powell and Pressburger fill the screen with striking compositions and imaginatively conceived shots, such as the shadows of the hunters pursuing the fox in the opening sequence and the shot of a tree branch tumbling down a deep well for what seems like an eternity. The expressionistic use of shadows is also effective; for instance, when Hazel rescues the fox from the hunters, or when she hesitates in a stairway off-camera as Reddin comes to call at the parson’s house, her shadow just peeking into view. However, the effectiveness of these images derives from their context in the film, not just their visual beauty, and scene after scene is imaginatively staged and skilfully executed. For example, there’s the sequence showing Hazel’s reunion and illicit tryst with Reddin, which is played out wordlessly, and framed by the vast landscape. In a later scene, where the parson confronts the squire in the latter’s home, the confrontation between the two men and Hazel is viewed from behind the flickering flames under a fireplace, hinting at the anger and passion in the scene. Although Gone to Earth represents a unique and tantalising collaboration between producers Powell and Pressburger, two of Britain’s finest filmmakers, and Selznick, the legendary Hollywood mogul, the film had a troubled production history. 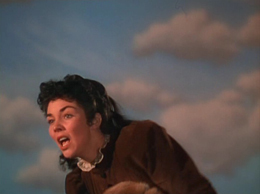 A 110-minute version of Gone to Earth was released in England in 1950, but Selznick (who was married to Jennifer Jones) was unhappy with Powell and Pressburger’s cut of the film. Selznick decided to put together a new version of Gone to Earth for the American market, hiring Rouben Mamoulian to direct new scenes, cutting out other scenes, and renaming the film The Wild Heart. This new version of Gone to Earth was released in the US in 1952 at an abbreviated running time of 82 minutes. Thankfully, the full version survives and stands as testament to the unique filmmaking skill and imagination of Powell and Pressburger, who conjure up a world that is vivid, haunting and compelling, and tell a memorably magical tale that can stand proudly alongside their finest cinematic achievements.